Once the border crossed without any issue (only passport, driving licence and documents of the vehicles are required) we did a quick lunch break in the Tulcan village. We took the opportunity to withdraw some American dollars. Indeed, Ecuador is the biggest country in the world which doesn’t have his own currency. Since the 9th January 2000, the American Dollar replaced the “Sucre” which didn’t survived the economics and politics crisis in Ecuador during the 90’s. Then, we headed to the South and did 150 kms on a nice asphalt to reach Ibarra. We spent a week there. Not because the city is beautiful (to be fair, we didn’t take the time to visit the city), but because we needed to work on the sidecars. Therefore, we enjoyed the nice Summerwind campsite to take out the toolbox! 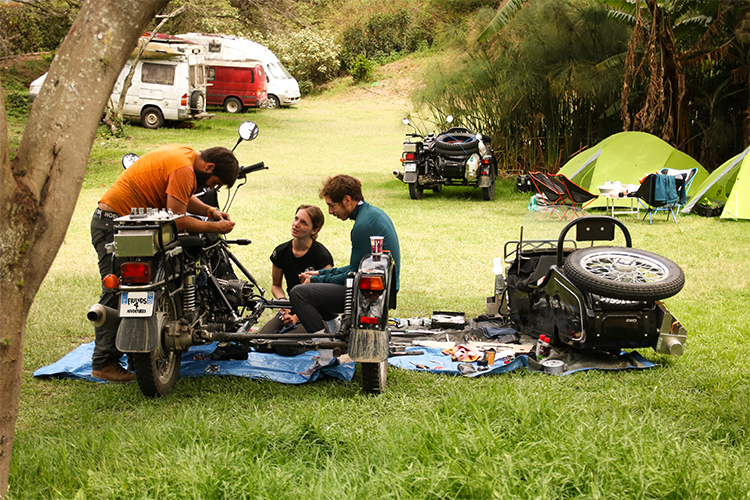 Opening the engine, valve adjustment, … all of this in the grass with midges giving us compagnie. Each one of us got hundreds of bites! Between a few hours of mechanics, we managed to enjoy the nice view of the Laguna Yahuarcocha. 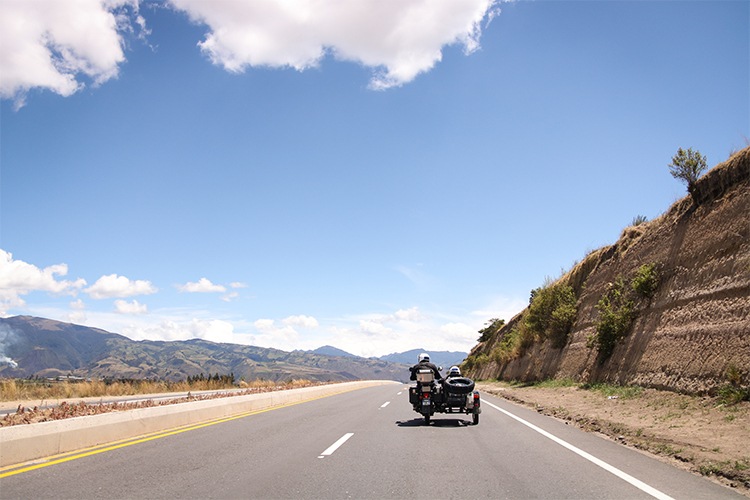 From Ibarra, we kept going on the Panamerican Highway up to the Otavalo village. We were there the Saturday, day of the meat fair. The city is buzzing. Inhabitants of the city or the surrounding mountains are meeting on the main square. We are surprised to see as many people wearing traditional clothing. In Otavalo, women are wearing a white shirt embroidered with flowers with two skirts overlaid with the darkest on the top of the other one. Two colourful belts are holding the skirts. Women are also wearing a shawl on their shoulders to carry their babies, objects or food. Mens are wearing a white shirt and a trouser with a poncho. On their heads, they are wearing a black, beige or cream-coloured hat made of felt. We saw similar clothing in the most of the cities crossed. 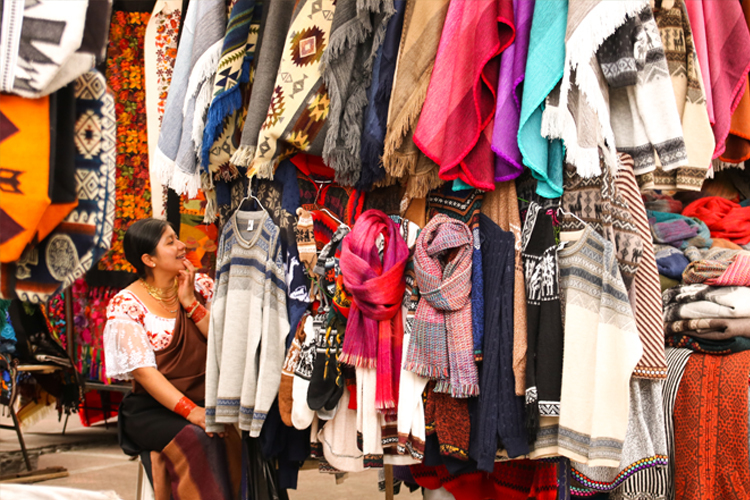 The main square, named « Plaza de Los Ponchos », is full of small stalls selling sweatshirts pullovers, ponchos and blankets. This market is a festival of colours where we can enjoy the kindness of Ecuadorian when we are walking in the market aisles. A few streets further, clothing and handcrafted items are replaced by veggies and fruits directly on the pavement. This is a different athmosphere offered to us, even more authentic. Smells of coriander, caramel and roasted chicken are mixing. We finally can’t resist for a sweet burger with figs before to go back on the side-cars. 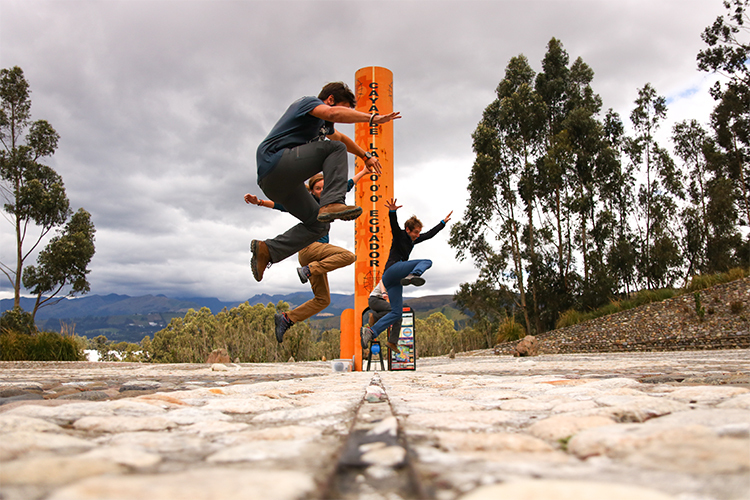 For the next step, we stopped at the house of Valentin, Fernando and Leydi in Cayambe, just a couple of steps away from the Equator named here « Mitad del Mundo.”. The true one – someone is asking me to specify. This is not the “Mitad del Mundo” for tourists which is 20kms on the North of Quito (which means 65kms away from here!). 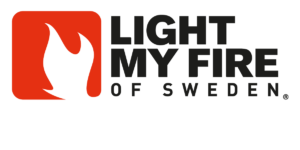 We spent a couple of nice days there, with lovely sharing moments in this place full of ancestral stories and cooking recipes. We discovered the constellations identified by the ancestors well before the Spanish’s arrival. We enjoyed a chicken « a la pachamanca » which is cooked in a hole on lava stones. We also learnt how to cook the true « empanadas con queso». On Earth, the Equator is crossing mainly oceans. Only 20% of its length is crossing emerged lands. The highest point on the Equator is on the southern side of the Cayambe volcano. This line gave his name to the country as its the best place to observe the sun positions all along the year. Indeed, there are many mountains around giving good point of references. As the Equator doesn’t have any more secrets for us, we are going back on our side-cars leaving the North hemisphere to go towards South and more specifically the majestic volcanos of Quilotoa and Cotopaxi. Hans will do everything he can do for you to have a quite stay in his campsite. The camping area is ideal and the facilities are good. At the end of the week, Hans is cooking. We recommend you to enjoy his German specialities cooked with a Peruvian touch!